I just finished reading this book with our daughter. J.R.R. Tolkien's Lord of the Rings, it's not. But it has every bit the adventure of my mother's stories about her life as a missionary in China, to which she travelled alone by freighter to Hong Kong, making her way inland to Chendgu, Sichuan, where she served as a medical mission nurse until my father arrived, they were married, they tried to stay after the Maoist revolution and after I came crashing into their lives. Perhaps this disposed me empathetically to the story about Sr. Theophane in Selfless. Selfless is the story of Sister Theophane, a passionate, driven nun dedicated to serving the poor around the world. Discover the inspiring story of how a precocious young girl from upstate New York became a servant and apostle to the poor in the jungle missions of Papua New Guinea, and, eventually, a prisoner of the Japanese in World War II. 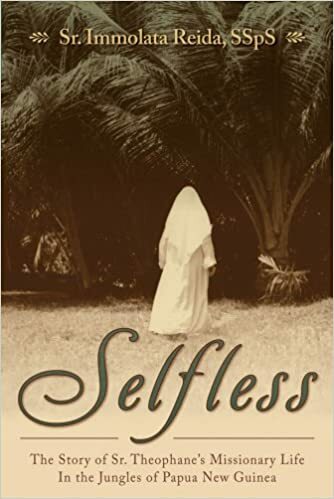 Selfless: The Story of Sr. Theophane's Missionary Life in the Jungles of Papua New Guinea was written in 1946 by a fellow sister of the Holy Spirit Missionary Sisters [Sr. Immolata Reida, SSpS], but it is just now being published for the first time. Long held in anonymity, Sr. Theophane's amazing life of service and apostolic zeal is now finally being revealed to the world. Her story is a breathtaking tale that will inspire a new generation of Catholics to heed the call of service to Christ and others. Our daughter was touched by Theophane's love of animals from when she was a child, through her horse-riding adventures in the mountain passes of Papua New Guinea. I was touched by her quiet heroism, her unflagging selfless zeal, and her untimely death as a casualty of the Pacific War (WWII). The ending is particularly moving, if you follow the threat of hear life throughout the whole narrative. 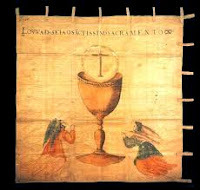 Pray for a renewal of the missionary spirit among Catholic women religious. Lord knows we need it. The cover alone makes you want to check it out... who publishes books nowadays without face shots!